A dessert sauce is a sauce used for desserts. It is drizzled or poured atop various desserts, and is also used for plate decoration. Dessert sauce adds flavor, moisture, texture and color to desserts, may be cooked or uncooked, and is sometimes prepared as a hard sauce with the addition of alcoholic beverages. It is used in various manners to add flavor to and enhance the visual presentation of desserts. In French cuisine, dessert sauces are often referred to as crèmes, rather than sauces. Dessert sauce is typically drizzled or poured atop various desserts, and may also be drizzled or poured on the plate. Dessert sauce examples include caramel sauce, custard, crème anglaise, chocolate sauce, dulce de leche, fruit sauces such as blueberry sauce, raspberry sauce and strawberry sauce. Raspberry sauce may be strained using a sieve to remove the seeds from the sauce. Dessert sauce adds flavor, moisture, texture, and color to desserts. It may be cooked or uncooked. Dessert sauce is sometimes prepared as a hard sauce with the addition of alcoholic beverages, such as bourbon, brandy or liqueur. 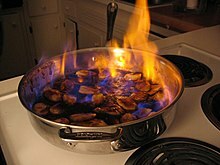 Desserts with hard sauces can be served flambéed because the ethyl alcohol in distilled beverages is flammable. Drops of lemon flavoring may be added to the sauce as a fire accelerant. Dessert sauces are used on many desserts such as cake, cheesecake, pound cake, and ice cream. Dry and firm desserts may be enhanced by the use of a dessert sauce that soaks into the dessert, which adds moisture and flavor. Dessert sauce can be used to add visual art to desserts, by using the sauce to paint designs and imagery on them. A plastic squeeze bottle full of sauce can be used to aid in decoration. Dessert sauce is also used on plates that desserts are placed upon, and can be arranged in an artistic design. A toothpick or knife can be used to swirl the sauce on plates to create various designs. Some companies mass-produce dessert sauces, such as British Sugar and The Hershey Company, and market them under various brand names. These products are typically available for consumers in grocery stores and supermarkets. ^ a b Tebben, M. (2014). Sauces: A Global History. Edible. Reaktion Books. p. pt80–82. ISBN 978-1-78023-413-7. ^ Sax, R. (1999). Classic Home Desserts: A Treasury of Heirloom and Contemporary Recipes from Around the World. Houghton Mifflin. p. 652. ISBN 978-0-618-00391-4. ^ Blashford-Snell, V. (2008). The Illustrated Kitchen Bible. DK Publishing. p. 446. ISBN 978-0-7566-6842-6. ^ Bronee, A. (2015). The Canning Kitchen. Penguin Canada. p. 309. ISBN 978-0-14-319457-6. ^ Women (2000). Busy Woman's Cookbook. Women's Edge Health Enhancement Guides. Rodale. p. 109. ISBN 978-1-57954-238-2. ^ a b c Joachim, D.; Hoffman, M. (2000). Prevention's The Healthy Cook. Rodale Books. p. 430. ISBN 978-1-57954-243-6. ^ a b Hines, D.; Hatchett, L.; Stern, M.; Stern, J. (2014). The Dessert Book. University Press of Kentucky. p. 275. ISBN 978-0-8131-4467-2. Retrieved February 6, 2015. ^ a b c d Lynch, L. (2008). Romance Cooking: Unlocking the Secrets of Seducing Mars Or Venus. AuthorHouse. p. 162. ISBN 978-1-4389-1654-5. ^ Baggett, N. (2005). The All-American Dessert Book. Houghton Mifflin Harcourt. p. 230. ISBN 978-0-547-34770-7. ^ Gienandt, F.L. (1919). The Twentieth Century Book for the Progressive Baker, Hotel Confectioner, Ornamenter and Ice Cream Maker: The Most Up-to-date and Practical Book of Its Kind. Four Seas. p. 170. ^ Pellaprat, H.P. ; Tower, J. (2012). The Great Book of French Cuisine. Vendome Press. p. pt1259. ISBN 978-0-86565-279-8. ^ a b Burkhalter, B.B. (2012). Raised on Old-Time Country Cooking: A Companion to the Trilogy. AuthorHouse. p. 149. ISBN 978-1-4772-8720-0. ^ Collins, P. (2015). How to Make Gourmet Sauces At Home. Lulu.com. p. 22. ISBN 978-1-329-01757-3. ^ Rombauer, I.S. ; Becker, M.R. ; Becker, E.; Guarnaschelli, M. (1997). JOC All New Rev. – 1997. Scribner. p. 1040. ISBN 978-0-684-81870-2. ^ a b Crocker, Betty (2007). Betty Crocker Cookbook. Wiley. p. 195. ISBN 978-0-470-17163-9. ^ Lury, C. (2004). Brands: The Logos of the Global Economy. International Library of Sociology. Taylor & Francis. p. 104. ISBN 978-1-134-52917-9. This page was last edited on 22 August 2017, at 10:47 (UTC).